A number of trees have been removed from a central reservation in a new development in Peterborough over health and safety fears. The trees have been uprooted from the reservation at the entrance of the Cardea estate on Apollo Avenue, which leads from the A605. The trees have now been replaced by traffic cones and rubble. The road is due to be adopted by Peterborough City Council, but a spokesman for the council said they would not be able to do this until the developer, Persimmon Homes, had carried out works. The council spokesman said they had asked for the trees to be removed as they had been growing into the road, causing a health and safety issue. The spokesman said the amount it would cost to maintain the trees ‘was not in the public interest’ - although did not reveal how much would have to be spent on the maintenance. Along with the trees, the council said there were a number of other issues in the development that needed resolving before roads in the estate could be adopted, including the realignment of the splitter island at the entrance to Jupiter Avenue, replacement of damaged kerbs, removal of a wall/structure from the roundabout, correction of line markings, re-surfacing, provision of footway and removal of maintenance bay. 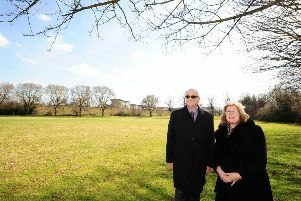 A spokesman for Persimmon Homes did not comment on any of the works they have been asked to carry out by the council.